Cordelia here 🙂 Byron bay was hippie and alternative with falafel everywhere! Lots of dreadlocks and buskers and bare feet. We spent half a day surfing here and it turned out to be one of our more challenging experiences! Hardest part was simply getting out past the huge waves before gracefully sliding onto your board, waiting for the wave, paddling hard, chanting ‘hands-knees-front foot-back foot-stand!’ Easy. Until you fall off and crash into another surfer, your board or the sand on the bottom, or instead get washed up onto shore like a beached whale! I was determined and wouldn’t give up, despite only standing for roughly 0.4 seconds in the whole 3 hours. Kels managed to get some casual one on one tuition from the surfer dude who was determined to get her to stand up – which she did…for about 0.8 seconds! All in all a very fun, exhausting afternoon and we were aching and bruised for days afterwards! Then onwards to Sydney! First glimpse of the opera house and harbour bridge on the bus was surreal and very exciting. So far we are loving the city and have done a walking tour and spent the evening on the 47th floor of a building in a revolving bar! 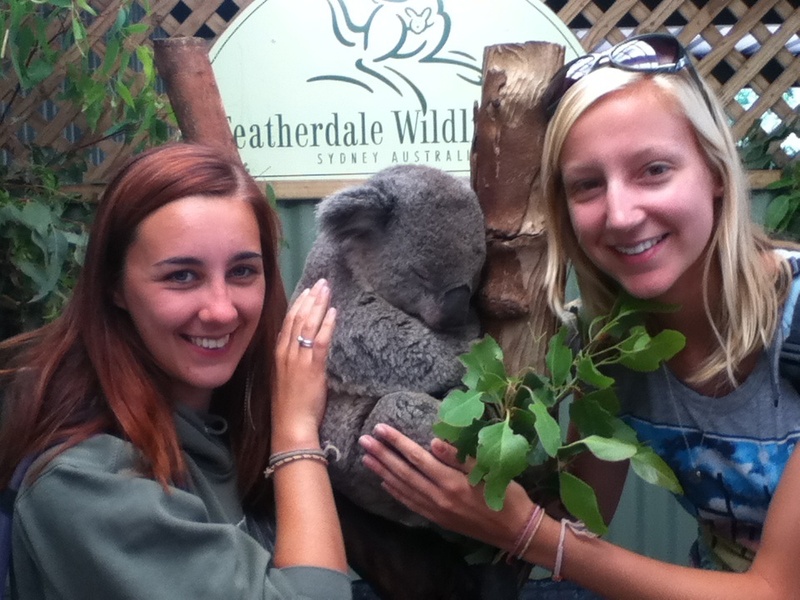 Today we visited the Blue Mountains which were spectacular, and got to cuddle more koalas and feed more wallabies. More exploring tomorrow. Very sad that we have less than a week left in Aus, not enough time to do all we want to do but we feel very lucky that we are here, and Melbourne is calling!